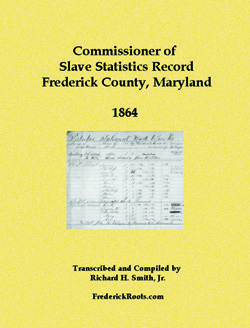 Commissioner of Slave Statistics Record: Frederick County, Maryland 1864 by Richard H. Smith, Jr.
* We prefer simple PayPal, or credit card through PayPal, purchases. If, however, your organization absolutely needs an Invoice, click this link to download a .doc file in which you can fill in relevant addresses, quantities, charges, etc. for submission to your purchasing department.